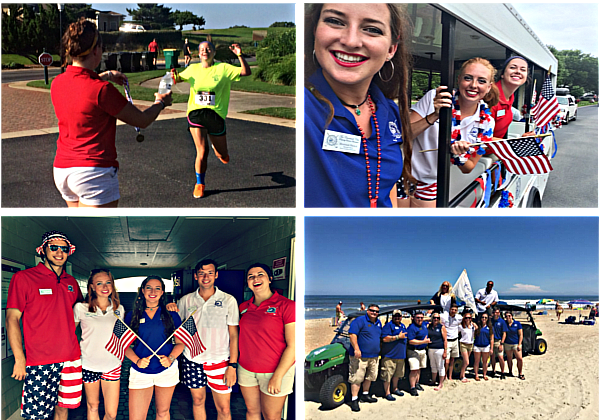 The 2019 Currituck Club summer interns play an integral part in all aspects of programming activities and events for an entire season in our exciting and very active beach community. If you have what it takes to capture the attention and imagination of over 3,500 guests each week, then The Currituck Club may be the place for you. From sports tournaments to beach games, pool parties to 5K runs; our expectations are to provide our owners and guests with a full day – every day – of activity choices from sunup to sundown. The Currituck Club’s chosen interns enjoy a dynamic and exciting work environment with comprehensive training and mentoring. Challenge yourself to contribute in the development of a premier resort community’s summer schedule. Have an idea for a new game or event? You will plan, execute and even budget it to maximize its success. You will learn while doing in a great environment that fosters and encourages unique thinking and originality. You will gain valuable experience and the confidence that comes from working for an organization with a reputation of excellence. Interns will be responsible for integrating all social media forms into their marketing efforts for the programs and activities they have planned. Interns will also be challenged with identifying innovative income and revenue sources. In addition to a competitive hourly wage, each intern will be eligible for a performance-based, end-of-summer bonus. An option for reduced housing is also available. If you are hard-working, motivated and friendly with a passion to serve others, and enjoy the idea of taking guest services to the next level, we invite you to apply for an internship position at The Currituck Club. You may submit a resume and a cover letter with a brief description of your skills, interests, experiences and why you think you would be a great fit for our program to our Operations Manager, Chris Dail, at Chris@CurrituckClubResort.com.